PRISMA® is an approach for identifying the areas that are most important to test, i.e., identifying the areas that have the highest level of business and/or technical risk. The PRISMA approach has been developed by Improve Quality Services in practice over many years. PRISMA is currently being applied in numerous projects and organizations in a wide range of domains and lifecycles including Agile development. Today, it is taught at several universities to IT students. The PRISMA approach especially supports the test professional in performing efficient product risk identification and product risk analysis while working in close co-operation with stakeholders. It also provides guidelines to define a differentiated risk-based test approach with the flexibility to address product risk in various project environments. 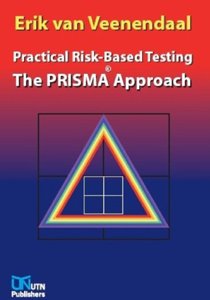 Practical Risk-Based Testing – The PRISMA approach provides a practical, realistic and effective way to introduce and maintain a testing approach that manages product risk, provides guidance to the testing effort and supports on-going process improvement efforts. Risk identification, risk analysis, risk mitigation and risk monitoring (with a special focus on reporting) are explored and presented in this book. Also included is a detailed description of the process that can be followed when performing a product risk assessment using the PRISMA method. The book discusses implementation issues, process variations, e.g., for Agile, relates user experiences and closes with a number of essential lessons learned while performing PRISMA in real-life on real projects. A supporting risk-based testing tool for the PRISMA approach is available upon request. PRISMA nieuwsbrief: Lees wat gebruikers zeggen over PRISMA.